In 'The History of Howeia' part 2 we learn more about the nuts and bolts of the Kentia palm industry. The second and concluding part of this fascinating story. Left, above left: Seeder Ray Shick gathering Kentia seeds. Right, above and below: Lord Howe Island in two views, an incredibly beautiful island whichever way you look at it. Lord Howe Island is a thin crescent shaped sliver of land less than 13km long at its widest point, yet condensed into this miniature world are towering mountains, gently rolling hills and valleys, verdant rainforests, secluded beaches and bays, an opalescent lagoon with fringing coral reef and last, though certainly not least, extensive forests of seductively swaying palm trees. The island is a biologists' paradise. The high proportion of rare and endemic plant species, the huge colonies of tame sea birds, the unusual volcanic geology and the teeming marine life all helped to make the island a perfect laboratory for biological research and study. 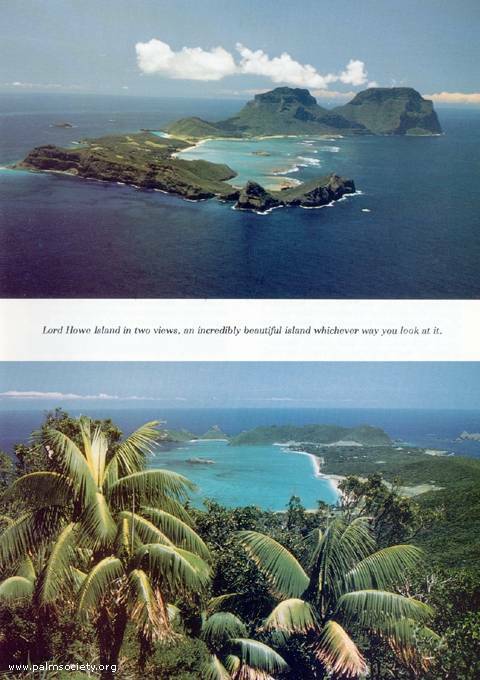 It was small wonder that the island had been inscribed on the United Nations World Heritage List in 1982 as being a singular environment "of outstanding universal value"
Among the nearly 200 species of indigenous flowering plants found on Lord Howe, there are four endemic palm species. One of these - Howea forsteriana, known as the Thatch or Kentia Palm - has the distinction of dominating much of the physical environment of the island, and the historical life of its inhabitants. The island was first settled in 1834, and supported a small population of English and American settlers, who relied on growing vegetables to barter with passing whaling ships. When whaling declined in the 1870's the island faced a bleak economic outlook. Remarkably, however, within a decade the Kentia palm had become the doyen of the indoor palm market in Europe and provided a great source of income for the islanders. Much of my knowledge about the Kentia palm industry has developed through contact and conversation with the Lord Howe islanders, many of whom have been involved with the Kentia palm for their entire lives. My first seed collecting expedition occurred several years ago with Islander Ray Shick. Ray had been involved in seed collecting and other traditional island activities since he was a child, and still looked athletically fit at 60 years of age. Visiting his property at the remote south end of the island, under the shadow of the 866m high Mt. Lidgbird, was like a step back into the quiet days of the island's agricultural past. Rural sounds were everywhere - the barking of the farm dogs, the lowing of cattle, ad even the hum of carefully tended bees. Today Ray intended to climb some 400 metres up the north flank of Mt. Lidgbird, where a high pocket of Kentia palms spread beneath a towering cliff called "The Greyface". When Ray appeared, he was dressed, in a comfortable flannel shirt, a pair of khaki workshorts, heavy leather boots and a woollen cap. He carefully loaded his gear into a large rucksack, including the vital seeding strap used for climbing palms, and a locally made device called a 'cubby' - a simple rucksack-type harness that could be used to carry heavy loads of seed. With the rucksack now securely on his back, and two farm dogs racing ahead, we set out across a grassy paddock. Within a few minutes we were climbing upward through a thicket of trees toward our final destination - the Greyface. As we plodded steadily upward, Ray explained that the Kentia seed on Lord Howe Island is harvested every year beginning in March, with the collecting season lasting many months. Palm forests on the island are divided into harvesting areas depending on the maturity of the seed. The warmer lowland areas are the earliest maturing, and so are obviously harvester first. The Greyface, where we were heading, is a much cooler mountain habitat and so the slower maturing seed is not collected until June. Ray explained further that the Lord Howe Island Board (the island's local government authority is responsible for determining the harvesting dates for various areas and for setting the fees for collection of seed. Collection rates are based on the degree of difficulty in gaining access to each area. Thus a remote and rugged place like The Big Slope behind Mt. Gower, accessible only by boat in good weather, attracts a higher rate than seed collected around the settlement area. All plants and seed are considered the property of the Island Board, which has powers derived from a special Act of Parliament, the Lord Howe Island Act. The revenue derived from the seedling industry is returned to the island in the form of local government services and public works. Unlike most other Australian communities, Lord Howe islanders do not have to shoulder the burden of local government expenditure through the payment of high rates and taxes. My conversation with Ray was interrupted after an hour, when we arrived in a thick stand of Kentia palms beneath a craggy grey cliff on the north-western flank of the mountain. It is unusual to find these palms growing at a height of 400 metres because they usually favour the lowlands. Here, however, they look exceptionally healthy, and regularly bear heavy crops of seeds. Without rushing, Ray methodically emptied the contents of his rucksack. Then he put on his special climbing boots - stout leather shoes, each having a wide strip of tyre-tread fastened across the sole. These tyre treads help the seed collector grip the palm trunk, and are assisted by a circular jute or canvass strap that loops around both boots. In earlier days, seed collectors wore spiky hobnail boots and, consequently, one can still see deep vertical scars gouged by the hobnails on older palm trunks. Ray walked up to the nearest palm and looped h is seeding strap around both boots. Reaching up, he grasped the palm with two hands, then jumped off the ground, locking his boots and strap against the palm trunk to prevent himself from slipping back down. Again and again Ray repeated this movement as he shinnied up the tree, like the proverbial monkey on a stick. Having reached the top, he began to grapple with the mass of seed [spikes beneath the crown of leaves. On the Kentia palm, seed spikes of about half a metre in length grow from the trunk in clusters or "hands" of five. Each spike bears up to 70 individual seeds, which go from dark to light green and finally red as they ripen. The "hands" of five are firmly anchored to the palm trunk, and require a powerful, wrenching tug to free them. Working systematically, Ray tugged away at the seed spikes with one arm, but transferred them immediately to the other as soon as the spikes had been dislodged. Once all had been [picked, he slipped back down the palm trunk, this time assisted by gravity. Using his boots and strap to allow the slow descent he came to a gentle halt at the base of the palm. This particular tree yielded about 10 kilos of seed (a third of a bushel) worth about $60 to Ray. Most trees yield less than this but the occasional tree will yield 40 kilos or so. Ray is paid about $200 per bushel to collect the seed from the Greyface, the island Board could sell the seed for four to five times that amount. These days, however, the seed is never sold outright. Instead it is germinated at the Board's Island Nursery, and then wholesaled as shot seed or small seedlings, thus increasing its value over threefold. Ray knew instinctively which trees would yield the most seeds, and he climbed them one by one in the same effortless manner. After climbing about eight trees, he had accumulated sufficient seed to commence the task of "shelling" or stripping the individual palm seeds from their long seed spikes; Ray simply thrust the seed spikes into a sack and trampled on them. Within a few minutes, the loud crunching sounds had ceased and the now bare seed spikes were withdrawn from the sack, leaving the individual seeds in the sack. Repeating the process, Ray managed to fill three large jute sacks with palm seed, a quantity weighing some 200 kilos. By midday, he felt he had collected enough seed for the day, so we gathered up our gear for the return journey. Ray bundled one of his three sacks of seed into the 'cubby", a rucksack-like harness with shoulder straps and a cradle supporting a full bag of seed. The other two remaining sacks were to be left for another day's expedition. Once back at the house, Ray took this bag of seed straight to the island palm nursery. The nursery had its origins in 1979 when an island businessman and Board member, Alan Williams, offered to establish a local nursery to increase the revenue for local administration. Until this time, all palm seed had been shipped away to mainland and overseas nurserymen. Alan hoped that a local nursery would return to the island a much higher percentage of the profits being made from the palm trade. His foresight was complemented by the technical expertise of an officer from the Department of Agriculture, Chris Weale, who arrived in June 1984 to improve the nursery operating efficiency. Ray left me with islander Larry Wilson (who trained under Chris Weale) and now manages the operation. On the first stage of the tour Larry took me to the shed where palm seed is air dried in special boxes. The drying process takes from two to three weeks, and helps to break down the tough outer husk that would otherwise retard germination. The seed is then fumigated against diseases and transferred into special plastic germination boxes about 50cm by 34 cm in size, about 18cm deep. There it is mixed with peat moss and perlite, an inert substance that helps aerate the mix. This composite brew of seeds, peat moss and perlite is thoroughly moistened, and then sealed in a large plastic bag to prevent dehydration. Once the boxes have been prepared in this way, they are stacked on three tiered racks in tunnel shaped igloos, each igloo has a whitewashed plastic cover to keep the seeds warm at night and cool during the heat of the day. Larry explained that germination can take from six months to three years, though most seeds sprout within eighteen months. Annual seed harvest vary from about 700 to 1500 bushels, and with each bushel of seed requiring 14 germination boxes, I could see clearly why 19 large igloos were required for germination space at the nursery. Walking into one of the igloos, Larry thrust his hands into a germination box and extracted a handful of healthy palm sprouts. These, he told me, are usually harvested when a single leaf shoot is about 25mm long, by which time the seedling also has a strong root system. The harvesting of these small sprouts is the most labour task at the nursery, and so some eight casual workers are employed to carry out this task. The casuals can always be located in the nursery by their blaring transistor radios, which help ease the monotony of an extremely tedious and repetitive operation. After inspection of the igloos, Larry took me to the packing shed where the young palm sprouts are prepared for shipment. There, a nursery assistant was busy washing seedlings in clean water to remove all traces of peat moss and perlite. The seedlings were then dipped into large tubs containing fungicide solution, intended to maintain them disease free for their journey to Australia or overseas. In the final stages of the operation, the seedlings were packed into large Styrofoam boxes in lots of 2000. These containers provide good insulation for their live cargo, and are light enough to bear the cost of air transport to customers anywhere in the world - such as Henk and Robert van Staalduinen in Holland. Today, although palm seeding is still important, a small tourist industry supports most of the islanders. Just a two-hour flight from Sydney or Brisbane, the island is increasingly visited by those wanting to experience unspoilt nature. The island rainforests are crisscrossed by walking trails that take visitors to many points of scenic interest, thronging bird colonies, remote rocky coves and secluded beaches. Swimming and snorkelling in the lagoon are popular and scuba facilities are available. Roads are minimal and bicycles are the main form of tourist transport. To maintain the integrity of the environment, the Island Board limits tourist beds to 400, so visitors can be assured of an uncrowded holiday. Travel arrangements can be made via Fastbook Holidays in Sydney at Level 1, 163 Eastern Valley Way, Middle Cove, NSW 22068, Australia. Additionally, the author escorts personalised nature tours to the island. 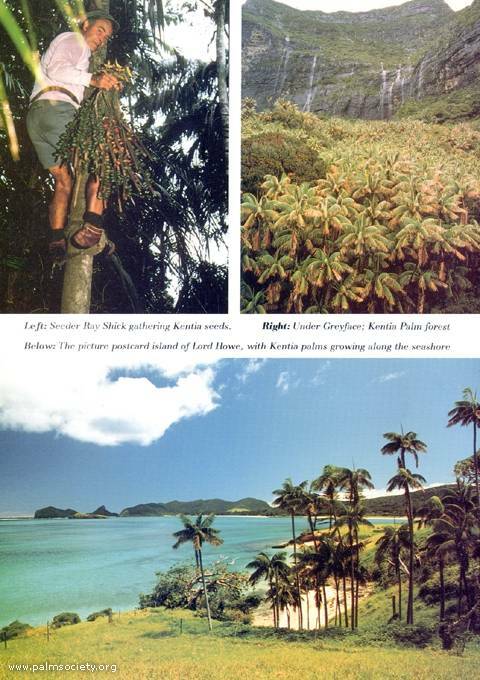 Anyone who has old photographs or information relating to the Kentia palm industry, please write to Ian Hutton, P.O. Box 6367, Coffs Harbour, NSW 2450, Australia . For those interested in Kentia palms in Europe, contact Henk van Staalduinen, Fazantstraat 35, 3145 CA Maassluis, Holland.